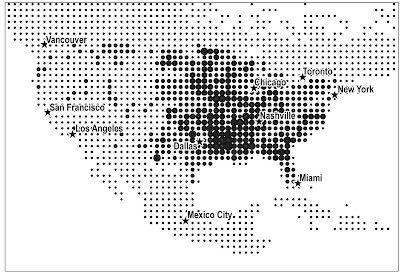 The size of the dots in this map represents the relative number of mentions of the word “church” in placemarks uploaded to Google. Results for the word “church” have been divided by the "0" and "1" baseline measure (see the last two blog posts), thus highlighting the parts of North America in which mentions of the word “church” are over- and under- represented. Interestingly, while the “bible belt” in the physical world is often talked about as being synonymous with the American South, the virtual “bible-belt” additionally incorporates large parts of the Midwest. Less surprising is the fact that the Northeast and the West have relatively low scores. The GeoWeb is in many ways a mirror (albeit a distorted one) of the physical places that it represents.